Again from our archives, thought I would pull out tasting notes for a whisky from Island of Jura – one of Scotland’s more inaccessible distilleries. The speculations proved correct! We understand the colour is adjusted with caramel and the whisky is a mix of young and aged (apparently up to 21 years) from ex bourbon casks. Not bad however when bluntly asked “Would you want to stock this?” The honest answer was… probably not… even though it is a rarity in being an eminently affordable whisky. Don’t get me wrong – it is an affable, slightly brash young whisky and not bad if you calibrate your expectations according. For all of you taste gurus out there, you may pick out hints of honey and pine, as the balance of peated and unpeated spirits is matured to perfection in ex-Bourbon casks. The finest young and aged (up to 21 years) whiskies go into this mysterious bottle, so there’s a different flavour to explore with every drop. 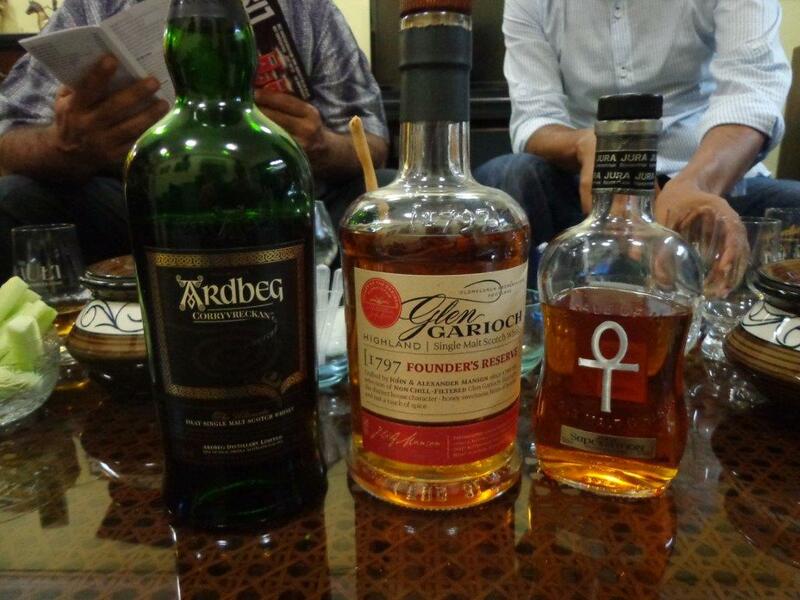 As you can see from the photo, we also sampled the Glen Garioch 1797 Founders Reserve and Ardbeg Corryvreckon the same evening. Alas our poor Jura was out-powered by the others. This entry was posted in Island, Scotland and tagged Island, Jura, Jura Superstition, Jura Superstition review by Carissa Hickling. Bookmark the permalink.